Every year an increasing number of establishments, increasing the range and quality supplied to these dishes. The owners spare no expense on the design of the room, ordering a custom design and expensive dishes, but the quality of service leaves much to be desired. Today is a good, competent waiter literally worth their weight in gold and will to work in any restaurant. 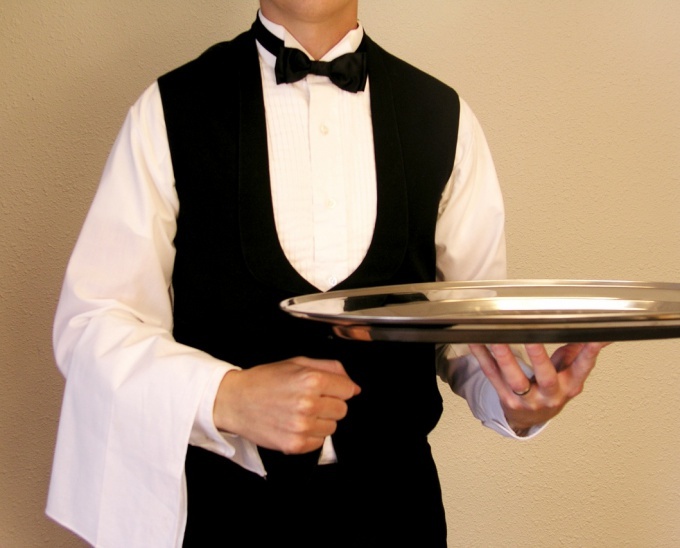 The waiter – the authorized representative of the institution. He, his services, give the customer a first glimpse of the work perform all other employees of the restaurant. No kitchen, however good it may be, will not force you to stay a customer if he immediately does not like how he met and started waiting on the waiter. The first thing you pay attention to the customers, neat appearance, neat hair, ironed clean clothes, spotlessly clean hands. Nobody is nice to see how people do not learn to observe the rules of hygiene, and serving food. With your first words, greetings with a smile starts the communication with the client, you must be courteous, must know the techniques of service and be able to apply them in practice. To help the client to make a choice, you have to be not only a psychologist, but know the basics of commodity food products and cooking. Two main points define the atmosphere at your table: maintenance procedure and its mood. In order to properly serve the customer, review the appointment of Cutlery, crockery, rules of table setting, serving and placement of the devices, the order of serving dishes. You must know the correspondence between the supplied food and drinks, always to be able to gently advise the client and help him make the right choice, taking into account features of national cuisines. You should also know the subtleties of the maintenance associated with national traditions, to be able to serve guests in the main traditions of serving dishes: French, Russian, English, American. You need to know the basic rules of service – how to serve and remove dishes, pour the drinks and change the instruments to keep plates, Cutlery, glasses, how to keep in order the working area. Drinking atmosphere is largely dependent on you. Try to anticipate the desires of the client, listen carefully to the order, tell him in detail about the quality and composition of meals, be unobtrusive, but attentive, friendly. You will also need endurance and emotional stability, good powers of observation and memory. An additional advantage to a good waiter is knowing one or two foreign languages.